Finalize and adopt the plan based on the extensive analysis and stakeholder feedback garnered throughout the process. The transportation projects included in the 2015-2040 Regional Transportation Plan (RTP) are planned to meet the travel needs and improve the quality of life within the Wasatch Front region for the next 30 years. The Wasatch Front Regional Council (WFRC) developed project lists with residents, local government stakeholders, and partner agencies by collecting project ideas and testing them against the RTP goals. To be implemented, the region will need both existing and additional transportation revenues. For additional information regarding the revenues, visit the “Select Projects and Phase” page. In addition to regional road, transit, and bicycle improvements, the 2015-2040 RTP also recommends general policy for transportation systems, enhancements, regional freight movement, safety, preservation and maintenance, and homeland security. The RTP conforms to federal air quality standards, meaning that the vehicle emissions estimated for the year 2040 are within the limits identified in the State Implementation Plan (SIP). The interactive map contains all of the roadway, transit, and bike projects proposed for the 2015-2040 RTP. Users can view the project phasing by turning layers on and off. Programmed roadway improvements in the 2015-2040 RTP include a balance of freeway, highway, arterial, and collector road projects. The projects add needed capacity through the construction of new facilities or the widening of existing roads. Two new freeways, the Mountain View Corridor and West Davis Corridor, are planned. One principle arterial, the Bangerter Highway, is proposed to be converted to a freeway. These large-scale projects will help offset the growing travel demand throughout the region. The need for approximately 182 miles of additional capacity on existing freeways, such as I-15, SR-201, I-215, I-80, and US-89 is also recognized and addressed. The 2015-2040 RTP includes new or expanded arterial streets and freeway improvements required to serve the existing and developing areas of the Wasatch Front region. Approximately 592 miles of capacity improvements are proposed for construction over the next 26 years. Highway facilities that will be constructed or improved include approximately 182 miles of freeway, 185 miles of principal arterials, 95 miles of minor arterials, and 129 miles of collector roads. Major projects in the 2015-2040 RTP include the construction of the West Davis Corridor through Davis and Weber counties; the widening of US-89 in Davis County; improvement of portions of I-15 in Salt Lake, Davis, and Weber counties; the completion of the Mountain View Corridor in Salt Lake County; and the reconstruction of I-80 from 1300 East to the mouth of Parleys Canyon. 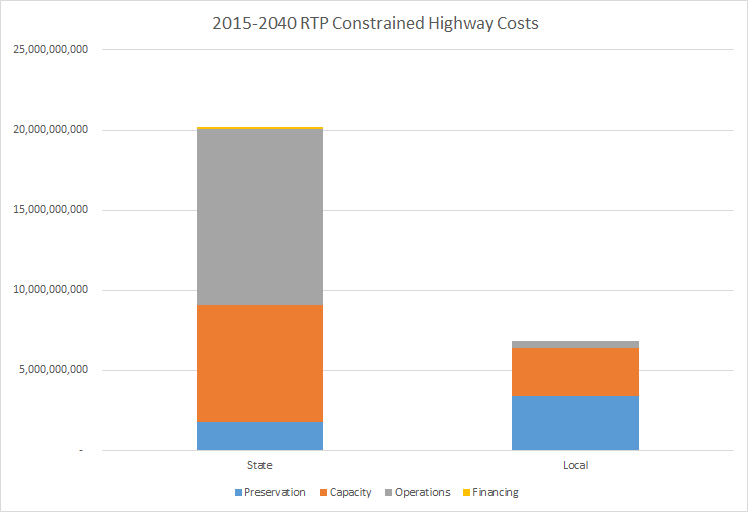 Due to financial constraints, not all of the new capacity projects recommended for construction by 2040 can be met by the 2015-2040 RTP. 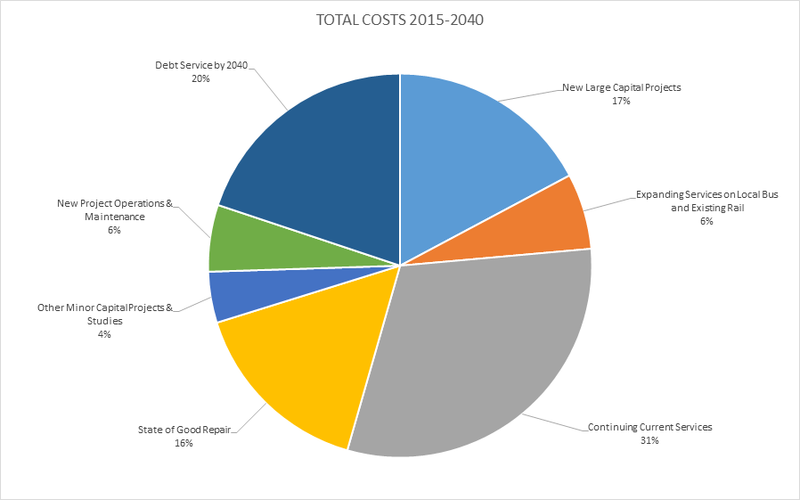 However, by identifying expected highway revenue and expected construction and maintenance costs, WFRC’s staff has developed a list of new capacity roadway projects for which funding will likely be available beginning in 2015 and continuing through 2040. 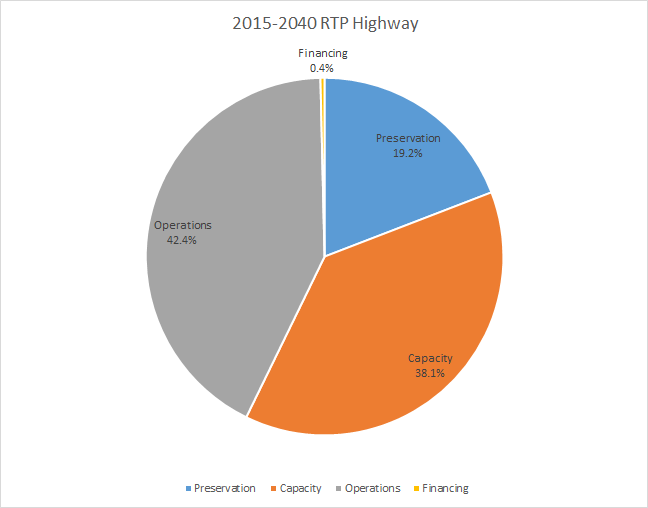 The 2015-2040 RTP roadway projects list identified segments of corridors which will require new construction, widening or upgrades, or operational improvements. Each project description includes the project number, project name, project length, type of improvement, number of lanes, current right-of-way width, proposed 2040 right-of-way width, functional classification, length of improvement, category of bicycle improvement, facility owner, when the project is needed, financially constrained phase, current cost, and phased cost. The 2015-2040 RTP roadway projects list can also be accessed via the interactive map by clicking on the project, and viewing the information in the pop up box. 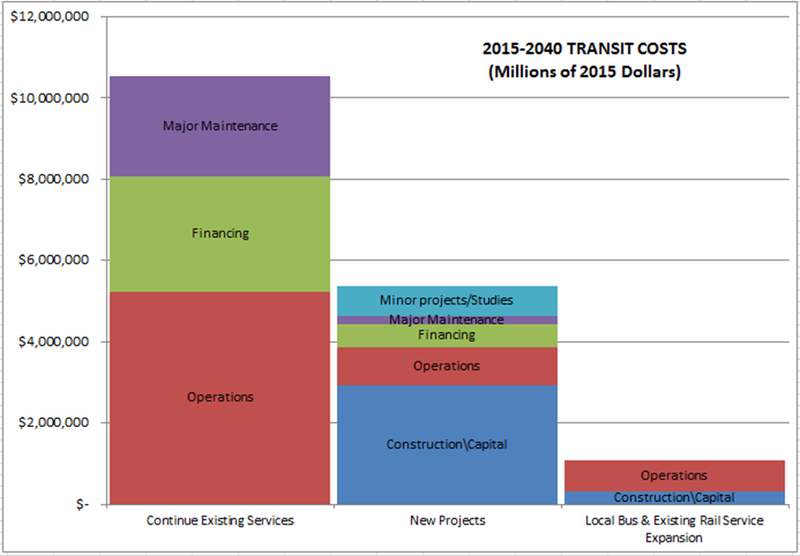 The 2015-2040 RTP proactively plans for more transit service improvements than ever before. The transit projects in the RTP support the growth of community centers that provide better job access for residents. This is a key strategy of the shared Wasatch Choice for 2040 Vision.The 2015-2040 RTP proactively plans for more transit service improvements than ever before. The transit projects in the RTP support the growth of community centers that provide better job access for residents. This is a key strategy of the shared Wasatch Choice for 2040 Vision. The Plan identifies one billion dollars to expand services on existing local bus and rail. This makes up almost one-fifth of new expenditures. The breakdown by phases for service expansion is as follows. Phase 1: 28% of new funds used for service expansion of the current transit system. Phase 2: 18% of new funds used for service expansion of the current transit system. Phase 3: 15% of new funds used for service expansion of the current transit system. Transit needs identified in the RTP include frequency of existing local bus and rail services, expanded hours of operation, and expanded transit coverage area. There are two billion dollars identified to build enhanced bus and bus rapid transit (BRT) projects. Many of these projects focus on enhancing core bus service routes by providing more frequent service. Ultimately, even new capital projects are largely projects that improve bus service. The RTP also proposes nearly one billion dollars to construct new rail lines. The RTP ensures transit investments are taken care of by specifically allocating approximately three billion dollars to major maintenance of the existing system or State of Good Repair (SOGR). Many physical projects that were previously planned to be built earlier are now listed in the “unfunded phase” or deferred to a later phase. This is because funds have been prioritized to be used for the SOGR, in addition to an increased focus on expanded transit service. The RTP also allocates seven billion dollars to continue and expand current services, as well as operate new projects. The 2015-2040 RTP considers and plans for all modes of travel, and this plan specifically looks to integrate active transportation into the transportation system. Many people walk and bike for their transportation needs—commuting to work, school, and shopping. Over the years, we continue to see growth in the number of trips, as well as the number of users as biking and walking increase along the Wasatch Front. Supporting these modes of transportation has many advantages. Bike and pedestrian activity is consistent with many of the RTP goals and additionally it promotes a healthy lifestyle, increases transportation options, supports a healthy environment through better air quality, and makes a positive contribution to the economy. The 2015-2040 RTP addresses the existing active transportation network, as well as those routes that are anticipated as part of the proposed future network, which can be viewed via the interactive map. Planning for active transportation is completed through two WFRC plans, including the 2015-2040 Base Bicycle Network, which includes all local and county plans, and the 2015-2040 Regional Priority Bicycle Network. The 2015-2040 RTP bicycle networks include many critical connections and look to make regional connections and support local communities. This growing network will increase access and give the current user the ability to capitalize on more routes, encourage additional residents to utilize the system, and enhance the safety of bicycle and pedestrian commuters as well as recreational users. Adding connections and new routes give the existing active transportation system more value. WFRC participates in many active transportation planning efforts, understanding that travel choices are critical to maintaining and building an efficient and integrated transportation system for the region. Overall, the 2015-2040 RTP places a growing emphasis on active transportation, considering access, convenience, and safety of bicycle and pedestrian path users a major priority among the bike plans and integrated within the roadway and transit projects.